Opening October 15, 2018 | Serendipity Labs is transforming an old Greenville space and working model. For 30 years, the former Plush Mill stood vacant– a lonely sentinel along the western entrance to downtown Greenville. A mix of brick and plaster on a 2.94 acre campus of Highway 123 near St. Francis Hospital, nothing changed except for the occasional busted out window or new graffiti tagged on its faded, aging walls. What a difference one year makes. Rumblings and rumors late last fall hinted at a new life for the site. It had been said before, but this time the stories were more concrete. Fountain Inn-based Britt Peters was going to start renovating, and co-working space was going to move. By late winter, the story was there. Serendipity Labs Coworking was breathing new life into the 24,000-plus acre former textile mill. Serendipity Labs was founded by industry leader John Arenas in 2011 with a singular vision: to build a network of inspirational members-only workplaces, combining state-of-the-art workplace design, technology, and security with the highest hospitality service level to deliver a peerless workplace experience. For years this building sat quietly waiting for the right vision to be planted. Seeing this place come to life is truly remarkable, said Ashley Stidfole, Serendipity Lab’s Greenville’s director of sales. “Every day there is something new when I come in,” she said. She means it. When I visited last week, construction was changing the interior of Serendipity Labs minute-by-minute. The 18 steps up to the mezzanine area were being cut in. Doors were being hung. Avante garde lighting was being installed from 10-foot-high office ceilings. A white marble wall that will serve as the coffee bar (Serendipity Labs will feature locally owned West End Coffee) was being readied. With a vibrant professional atmosphere, a variety of workstyle settings, and events curated by local Greenville staff, Serendipity Labs is designed to encourage serendipitous interactions that result in new ideas and business connections. Forty-five percent of its members come from well-recognized companies, 20 percent are start-ups, and 35 percent are independent professionals in their 30s, 40s and 50s. More than 40 percent are women – double the industry average. 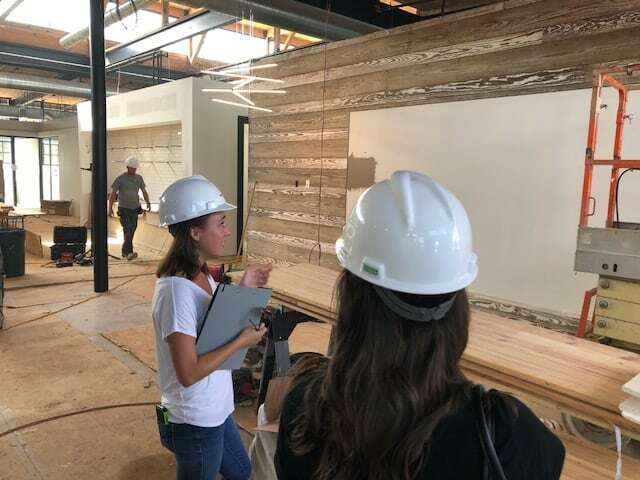 It will offer numerous office and co-working options when it opens in mid-October, said Stidfole, who has a steady stream of potential clients touring the facility. As many as 230 people can use the building at any given time between office and the co-working spaces. As part of the construction, workers tore down every part of the old mill save for the walls, floors, ceiling and 100 year-old plus support beams. Using those as a framework, crews have created a modern workspace out of Greenville’s past. Some other interesting tidbits will be a triangular-shaped park area just off one side of the building and a personal patio for events on another side of the building.